Climate change is a threat to all species, but which species will be under the greatest threat? The question is at the centre of research by a Monash University biologist Dr Vanessa Kellermann, who examines heat resistance – or 'thermal history' - to determine which species will suffer more as a result of climate change. The latest development in Dr Kellermann's work was published recently in Proceedings of the Royal Society B. "Getting accurate predictions of a species' risk to climate change is no easy task," Dr Kellermann said. "One way is to take species from the field and estimate heat resistance and see how close this estimate is to future climate projections," she said. The closer a species' heat tolerance is to maximum temperature of the environment the more at risk a species is to climate change. However, estimates of heat tolerance might be influenced by the environment a species is collected from. A species that grows up in a warm environment may have higher heat resistance than a species that grows up in a cold environment and this difference may be due to the environment they experience rather than their genes, explains Dr Kellermann. The study aimed to determine the extent to which estimates of heat resistance, a frequently used measure for climate change risk, are sensitive to changes in temperature during developmental or changes in temperature as adults. 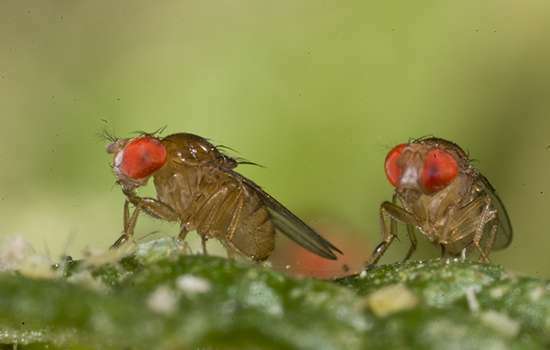 Examining the model species Drosophila melanogaster (common fruit fly) the researchers found that temperatures experienced during development had a bigger effect on a species' heat resistance than temperatures experienced as an adult. "Our study shows that current predictions of climate change risk for different species might be influenced by the environment they are collected in," Dr Kellermann said. So they take 3 flies and which ever one dies first when they raise the temperature is the one that is most affected? No. They take many samples of each species. From the looks of it, they also looked at how the young would be affected as opposed to the old.